Barel Karsan - Value Investing: Value Investments Gone Wrong? In 2004, motor vehicle sales were booming, as the economy was strong and customers continued to buy larger and larger vehicles. The stock prices of most car manufacturers (domestic and foreign alike) were at recent highs. Today is a different story, as the stock prices of GM (GM) and Ford (F) have plummeted from those highs, while Toyota (TM) and Honda (HMC) have held their own despite the tough environment. Assuming investors couldn't see the future (which would consist of high gas prices and a shift to fuel efficient vehicles), could investors have seen this coming back in 2004? After all, Ford and GM own some of the best consumer brands around...could they have represented value investments that just went wrong? Debt to equity levels much more than 1 make us a little bit uncomfortable. Debt to equity levels above 9 are astronomical! 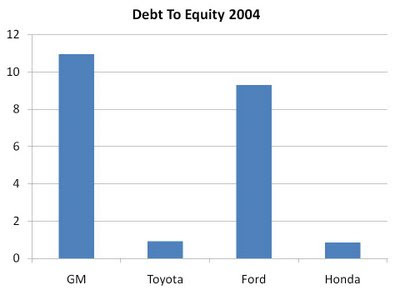 As we've discussed before, low debt levels allow flexibility, add more certainty to the estimated equity value, and allow a company to weather downturns and emerge from them stronger than ever (as Toyota and Honda appear poised to do). Going forward, make sure you know the debt levels of any company you plan on buying for the long term. What about the debt of equity level of the IBs? What are reasonable debt/equity ratios for different industries? In theory, an industry's debt to equity ratio is governed by its cyclicality. A highly cyclical business, for example, should have low debt levels so that it can survive the terrible years. For IBs, practically speaking, this is very difficult for an ordinary investor to figure out. IBs are not standalone; if they were, one could make a D/E estimate based on historical revenue or profit cyclicality (presumably, they are quite cyclical, as market financings come and go). Instead, the IBs are blended in with other divisions (credit lending etc.) with different D/E requirements, so the final number you see is a blend of various businesses. I have been following stocks under five dollars for many years. I also have a website where I give advise on low price stocks. Their are always bargains in low price stocks thats stocks under five or ten dollars one must have the time and be willing to put the effort into finding good value stocks' along with some knowledge about low price stocks.